Hi, I'm Liyuan! I first met WOG in the summer of 2010, and when I went through it, I left it. A few years later, I found this website. I can't believe this little game has so much Fan levels. I play the sections that fans make and complete all of the OCD that I like and can complete. It makes me more obsessed with the game than I used to be. My technique has also been greatly developed. 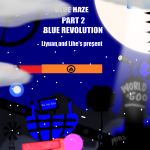 Then I met Lihe on QQ, and we planned to make an interesting chapter with the complete story, which is Blue Haze:). 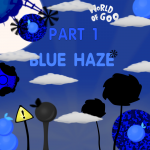 Now, I have been in this game a lot of achievements, collected 1500 balls, and completed Bubble Quest and Whack Pack full of OCD, my next goal is to finish making The sun and the hell, I believe that I am a good player. Do you want to make friends with me? You can contact me in WOG Discord. This chapter was made last year, and Lihe made it at a phenomenal rate after the completion of Part1.We are satisfied with it. I'm sure it won't disappoint you. :)The story is in a beautiful town with auroras.It contains 20 levels and a complete plot. Note: this chapter is difficult, and if you feel the same way, you can try part 2!! I found the mouse invisible! otherwise it will cause the support to collapse!! you can see a lot of small beauty on the left. you have to break it!